Brimley Dental Center has been known to serve Scarborough and surrounding areas for so many years. We earned the reputation for providing a high standard of dental care for families over generations in our relaxing, comfortable and friendly setting. We believe an informed patient is able to take the best decision for their health and well being. We strive in providing a personalized treatment plan for each and every patient to assure and maintain a long term dental health . If you're new to Scarborough and East Toronto area and in need of a Dentist, contact us today to book an appointment, we love meeting new patients, and we'd be honoured to work with you as your trusted lifelong dental team. There is no higher reward for us than to see the healthy, bright smile of our happy patients. We welcome new patients and appreciate your referrals! 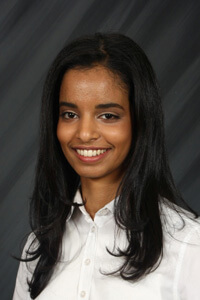 Dr. Monica Dinca graduated from University of Western Ontario in 2008. She also holds a dental degree from Romania where she practiced for 3 years before immigrating to Canada in 2002. In 2006 she was accepted into the International Trained Dentists Program at University of Western Ontario and went back to school to have her studies accredited. In 2008 she earned her Doctor of Dental Surgery (DDS) degree and upon graduation she was presented with the Septodont award for the student with the best results in oral surgery. She comes to the practice with excellent credentials. Following graduation she worked in London, ON in 3 of the city hospitals alongside renowned surgeons where she fine-tuned her skills in oral surgery. Since 2009 she entered private practice working as an associate dentist in dental offices in Peterborough, Kitchener, Hagersville and Hamilton. She is a member of Ontario Dental Association, International Association of Dentists, and Royal College of Dental Surgeons. She is also a fellow of the International Congress of Oral Implantologists and World Laser Institute. She has a special interest in oral surgery, cosmetic dentistry and endodontics, but she equally enjoys family general dentistry. She has had extensive training in placing dental implants and she is a true believer in continuing education to keep up to date with the latest dental technology. In 2013, The International Association of Dentists recognized Dr. Dinca as a Leading Physician of the World and a Top Dentist in Hamilton, ON. 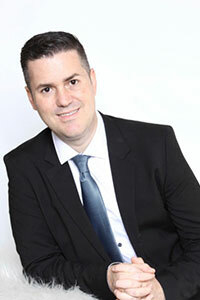 Dr. Dinca is looking forward to meeting you and your family on your next visit to the office. She is making a long term commitment to both the practice and to the community. 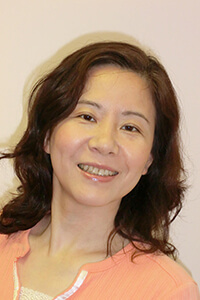 Brimley Dental Centre is pleased to introduce Mrs. Yanmei Zhang. Yanmei is a certified denturist, fluent in Mandarin and Cantonese with solid experience in the dental field. She is a much welcome addition to our team. From immediate, partial and full denture fabrication to denture repairs and implant supported dentures, YanMei can do it all! YanMei Zhang and Dr. Dinca will work together to assure the patients will receive the most timely denture care available. I am an internationally trained dentist. I was born in Venezuela and dentistry has always been my passion. It is very rewarding having two professions in Canada as a Registered Restorative Dental Hygienist and Denturist. My goal is to treat patients the same way as I would like to be treated. I graduated from George Brown College’s Level 2 Dental Assisting Program in 2012. I am privileged to have joined Dr. Dinca’s dental team at Brimley Dental Center in June 2014. As a dental assistant I am continually learning new things and my goal is provide comfortable patient care to all patients. My primary role is as a level 2 dental assistant, but sometimes you may also see me at the front desk. I graduated from George Brown College’s Level 2 Dental Assisting Program in 2008, and then followed up by graduating from the school’s Dental Hygiene Program in 2012. I’m excited to be a part of Dr. Dinca’s team at Brimley Dental Centre. As an RDH , I pride myself on being conscientious and meticulous. My goal is to always ensure my patients feel comfortable, providing patients with the utmost care and advice to practice great dental hygiene. I am an Internationally Trained Dentist from Philippines, and have been practicing in Canada as a hygienist since 2008, being a graduate from the Dental Hygiene Institute in Hamilton. I am dedicated to providing quality and personalized dental hygiene care to my patients of all age categories. Composite bonding can work wonders for your smile. Using materials that match the shade, translucency and the texture of your teeth, gaps between teeth can be closed, spots and discolorations can be eliminated, and your self-confidence can be enhanced through the improved appearance of your smile. The dentist will match the shade of your existing teeth and then tooth-colored composite resin is applied to the tooth much like the filling procedure. The procedure is sometimes referred to as bonding because an adhesive agent is used to actually bond the resin to the tooth structure. The resin is hardened (cured) with a curing light and then shaped, contoured, and polished to give a cosmetic and natural appearance. Bonding is the least expensive cosmetic procedure and can be completed during a single dental visit. When you have a dental emergency give us a call and we will ensure we book you on the same day to take you out of pain. However, we are not a 24-hour dental emergency service and there might be days and times when none of the dentists is available. This part of the implant is made of titanium and is surgically placed in the bone. Titanium is accepted by the body extremely well and fuses with the bone (called osseointegration) during the healing process. This is a metal collar that attaches to the top of the implant screw and is the base for a crown, bridge, or denture. How much do Dental Implants cost and are they expensive? 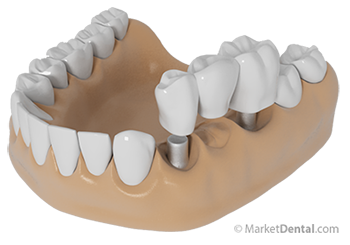 Dental Implants are a strong and durable restorative option since they are installed into the jawbone. They are made to look, feel and function as natural as your real teeth and provide great cosmetic enhancement as well. While dental implants can cost more than traditional dentures, they provide a solution that will last for many years, or even decades. It is a very common question that we get from people in Scarborough – how much do dental implants cost? There are a number of determinants and they can vary so much that it’s hard to give a quick answer. Many times the cost of tooth implants can be a deciding factor in getting the treatment. 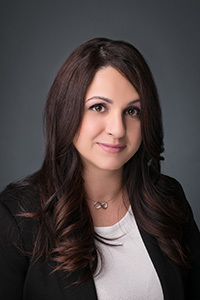 If you would like to get more detailed information about your specific case, please fill out our contact form or call us at 416-293-8063 to book an appointment with Dr. Monica Dinca. Frankly speaking, without proper consultation with your dentist, it is very difficult to determine the cost of dental implants. 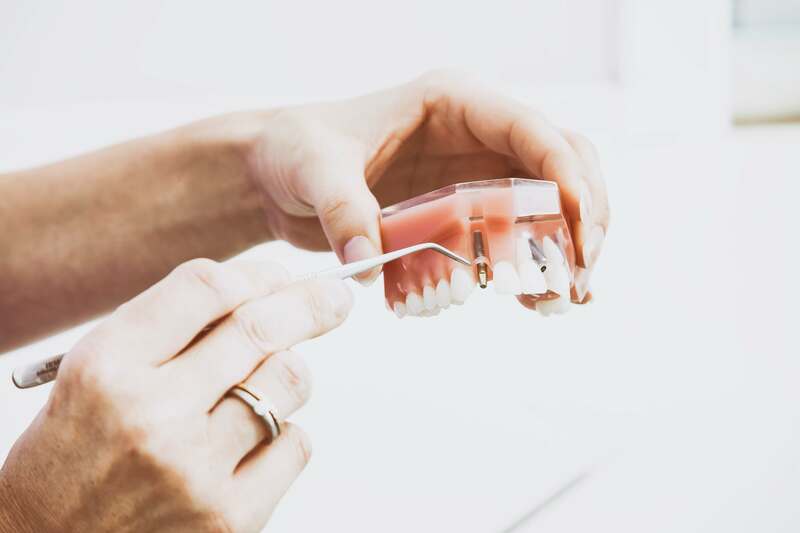 It can vary considerably, depending on the quality of the materials used in the implant and prosthetic tooth — such as titanium and porcelain — as well as the time and skill required for the procedure itself. It also depends on the number of missing teeth that need to be replaced and the number of implant posts that are necessary to secure your dental restorations. Depending on the scope of your procedure, the cost of your treatment may very well be less or more than the average price. Since dental implants are anchored into the jawbone, it is also important that your gums and teeth are in good health and that you have sufficient bone in the jaw to support implant posts. For some patients, bone grafting or other procedures may be required before the placement of dental implants. If you require any additional treatments in preparation for your dental implant surgery, these procedures will affect the overall cost as well. The best way to establish the cost of dental implants for you is to contact us and set up a consultation with Dr. Monica Dinca at his Scarborough dental office. For a lot of patients, dental implants could a relatively expensive procedure, but there are definitely a lot of benefits. Missing teeth create a gap that can affect how you look and how you chew. Besides the aesthetic value, in the long-term, your remaining teeth may shift and move as the forces on the remaining teeth are increased. This can lead to even more tooth loss in the future. 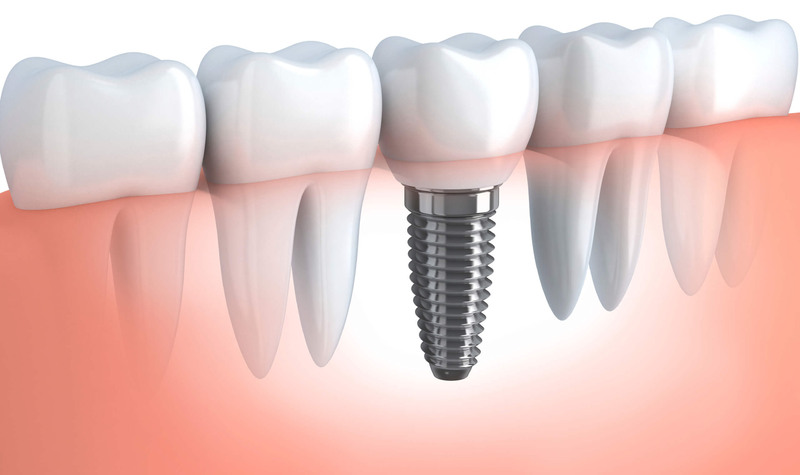 Dental Implants definitely provide a safe and reliable foundation for fixed or replacement teeth. They improve your smile and self confidence as well make it easier for you to chew food properly. They look and function just like regular teeth therefore in many cases they are definitely investing in, despite the costs associated with them. Dental Implantation can be done anytime after adolescence or when bone growth is fully complete. Certain medical conditions such as gum or periodontal disease may require additional treatment before the implant procedure can be performed. To determine if implants are right for you, your dentist will thoroughly examine your teeth and gums and evaluate bone density and quantity. This may involve X-rays and CT scans to ensure there is sufficient bone structure for placing the implant, and to determine exactly where the implant should be placed. Based on the condition of your oral tissues, oral hygiene and personal habits, and commitment to follow aftercare instructions, your dentist will advise you of the most appropriate Dental Implant treatment plan. Some patients with insufficient bone or gum tissue require bone or soft tissue grafts or the use of smaller implants. Call us now at 416-293-8063 to book a consultation with Dr. Monica Dinca. Periodontal or gum disease is an infection of the tissues that surround and support your teeth. It is a leading cause of tooth loss in Canadian adults. Good oral hygiene and regular dental examinations are essential in prevention and early detection of gum disease – which sometimes developing without any warning signs. The inflammation and infection of gums, ligaments, bone, and other tissues surrounding the teeth. Gingivitis (gums disease) and periodontitis (gums and bone disease) are the two main forms of periodontal disease also called gum disease or pyorrhea. 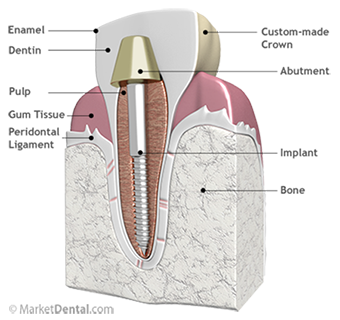 Scaling and root planing are the most common form of treatment for periodontal disease. Scaling removes calculus (also called tartar) and plaque from the tooth surface above and below the gum line. Root planing smoothes the root's surface and removes any remaining calculus. When the amount of plaque and calculus to remove is extensive, the dentist will numb the area to make the procedure comfortable for you. A combination of sonic and hand instruments are used in the procedure. The sonic instruments remove the large deposits of plaque and calculus. Hand instruments are then used to remove any remaining tartar and ensure all surfaces of the crown and root are clean and free of bacteria. Sensitivity and soreness may be present a few days following treatment and usually can be relieved with over-the-counter pain relievers. In office whitening can brighten your teeth by six to ten shades. Using a special, light-activated whitening gel, this procedure is a quick and convenient way to achieve the smile you've always wanted. In office whitening often takes between 30 to 90 minutes to complete and usually requires a few visits to the dentist's office to achieve the amount of whitening required. The whitening agent (again, a gel containing hydrogen peroxide) is applied to your teeth. Some of the in office whitening agents require special lights or heat for activation. Both in-home and in office whitening can cause increased tooth sensitivity in some people. this is a normal side effect and usually subsides a few days after the whitening treatments have been completed. Whitening procedures should be avoided if you are pregnant. At Brimley Dental Center, we are concerned about minimizing the amount of radiation you receive. That’s why we use digital x-rays. They offer the advantage of an 80 percent reduction in radiation, no need for film or processing chemicals, production of a nearly instantaneously image, and the ability to use colour contrast in the image. Laughing gas is an odorless and colorless gas, officially known as nitrous oxide or N2O. For patients who get uptight or squeamish before or during dental treatment, this commonly used sedative and anti-anxiety agent can help promote a sense of relaxation, calm and general well-being. Our sterilizers are tested daily with special biological indicators to insure that our patients receive dental care in the safest environment possible. We strictly follow the RCDSO guidelines for infection prevention and control in the dental office. We use in our office the newest and the best dental materials available on the market today. We only use white filling materials because of its life-like properties and ability to bond to the tooth. Although safe, amalgams have shown to cause more tooth cracks due to the metallic tendency to expand in a warm environment. Intraoral camera allows you to be an active partner in the dental treatment by enabling you to see what we see inside of your mouth. With a clear understanding of your dental conditions you’ll be able to make treatment decisions with confidence. This modern curing light maximizes curing power of the deep fillings and by its small size offers a maximum patient comfort. Dental implants can provide you with a better quality of life. When you're missing many or all of your teeth, you want a dental solution that is customized just for you, returns your smile quickly and reduces your time in the dental office. You have fewer appointments than traditional dental implant methods - Four appointments as compared to eight*. Surgery time is shortened because your case is planned out in advance. You go home with a same-day smile that is customized just for you. *Not all people are candidates for implant therapy. Speak to your dentist to see if dental implants are right for you. Number of appointments may vary. Available in five sizes ranging from o.6mm to 1.1mm, Curaprox interdental brushes are the answer to caring properly for the hard-to-care-for interdental space (the space between your teeth). Flossing often isn't enough to eliminate all hidden build-up in this space so the use of Curaprox is an excellent addition to your oral healthcare routine. Dr. Monica Dinca at Brimley Dental is pleased to be a resource and retailer for Curaprox interdenal brushes. Please make sure to go through a consultation to determine the correct size for you to use. We follow the current Ontario Dental Association fee guide. If you need fees specific to your treatment, the doctor we will need to conduct a Complete Exam. The results of the exam will be presented to you along with digital x-rays, including a panoramic x-ray. We accept most insurance plans and payments by Visa, MasterCard, personal cheques, cash and debit cards. Generally, we can advise you what treatments may or may not be covered under your plan. It is helpful if you bring in your current insurance booklet, so we can check the particulars for you. Where there may be a large bill for treatment, we will advise you in advance so that you can make arrangements for a schedule of payments. You don't have dental benefits? We will help you out. Your oral health is very important for you and the fact you don't have a dental plan shouldn't prevent you from getting the best dental care. Dr. Dinca has successfully completed extensive training for guided surgery and guided prosthetics for immediate full arch implant restorations. If you have heard about “all in four” concept and would like to learn more details about teeth in a day, book a complimentary consultation with Dr Monica Dinca and find out whether you are a good candidate for this type of dental work. Many patients are reluctant to have implants placed because it is a longer process. 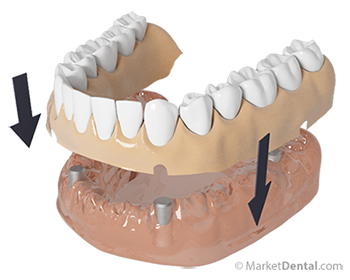 The Nsequence technique allows a patient to have in just few hours implants and a fixed restoration which functions exactly like natural teeth. Through this technique, Dr Dinca will be able to convert a full removable denture in an aesthetic and functional fixed prosthesis which will considerately improve the patient's quality of life. 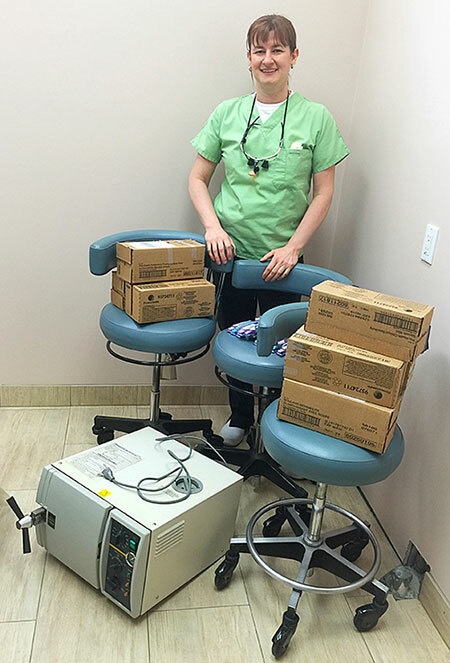 Dr. Dinca and Brimley Dental Centre brought a little contribution to impoverished people in need of dental care by donating to a Jamaican dental clinic a sterilizer, 3 dental stools, tooth brushes and tooth pastes. We offer free consultation for implants and wisdom teeth! When Monica was a small girl living in Romania, she had yearly visits to a wonderful dentist who was amazing with kids. She loved going for check-ups and told her parents that one day she would be a dentist. And she did just that. 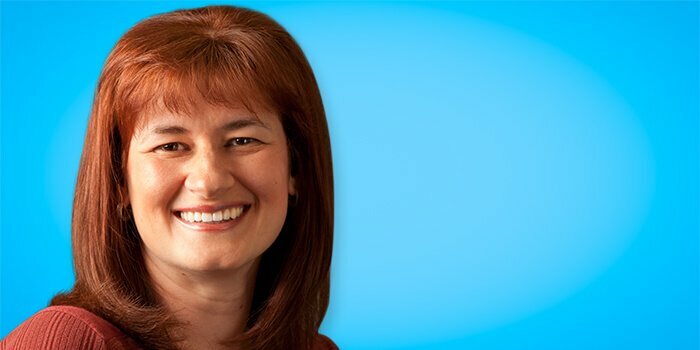 After being trained as a dentist in Romania, she came to Canada in 2002 and went back to university here to re-certify herself to Canadian Dental standards. She spent a few years working in the Hamilton area, but when a dentist in the Sheppard East Village was looking to sell his long-time practice, Monica decided to buy it and begin her dream. She likes the fact that all the same hygienists and staff were able to stay for consistency. "I’m the only new one around here", says Monica laughing. "I have only been in the area a few short months, I live and work here. I love the multi-cultural aspect of the area and look forward to trying all the different restaurants." She says her job is very rewarding. She talks of a young man that came to her and said that his brother told him he didn’t like his teeth because they had big spaces between them. Dr Dinca was able to re-create a beautiful new smile for the man and could see the joy written all over his face. "I am a perfectionist and I am meticulous in my work." She says, "And I have lots of patience with my patients at Brimley Dental Centre." Sounds like a great combination. Feel free to stop by and welcome Monica to the neighbourhood. Monica likes to share her Sheppard and remind everyone to floss. All files are available in PDF format. To view these files, you need to install Adobe Acrobat Reader to work with your browser. Please note that you need the latest version of Adobe Acrobat Reader to correctly read our forms. If you have problems opening a form, please try to update your version of Acrobat Reader. Our revolutionary teeth whitening gel consists of a solution that is safe for even the most sensitive of teeth. Carbamide Peroxide is an oxidizing agent most commonly used in whitening products. Iveri Whitening uses a concentrated blend of professional strength Carbamide Peroxide and Hydrogen Peroxide to deliver whitening results quickly. Potassium Nitrate, a key ingredient in Iveri Whitening gel, has been proven to virtually eliminate teeth sensitivity. And unlike other teeth whitening products, our gel uses Xylitol which not only sweetens the solution but more notably keeps your teeth hydrated throughout the whitening process. In 20 minutes you will notice your teeth become 2-8 shades whiter. Now that’s something to smile about! It has been a long time since you last saw a dentist and you need a check up? We offer free consultations for all new patients who book complete cleaning. You will be less willing to eat fresh fruits and vegetables, since eating these right away after chewing gum will taste bitter. You will be tempted to eat more junk food than healthy food. TMJ pain: chewing mostly on one side can provoke muscular imbalance, TMJ disorders, earaches and even teeth aches due to a constant low level of traumatic chewing forces. Digestive problems due to constantly swallowing small amounts of air which will decrease the digestive efficiency and bloating. You can get cavities if your chewing gum contains sugar, it is like you constantly coat your teeth with a thin pellicle of sugar. Sheep byproducts: chewing gums contain lanolin( a substance from sheep wool) which makes it soft, and while is not dangerous for you, makes the taste not very pleasant especially if you chew the gum for a few hours in a row. Releasing mercury vapours: there are studies showing that chewing gum increases the release of mercury vapours from the amalgam fillings. Milk and dairy products due to their calcium content are very important for the human body development and growth. As you age, calcium is an essential element in preventing osteoporosis. Casein, one of the ingredients in the milk coats the teeth and forms a protective film on the enamel, helping the teeth to strengthen against cavities. Between soda and milk, milk is by far a better choice. So stock the fridge with good and healthy snacks. American Academy of Pediatric Dentistry agrees that chocolate milk is a good snack, together with buttermilk, puddings, cottage cheeses and even ice-cream. Visit your family dentist regularly. At your check up and dental cleaning appointment Dr Dinca will assess your teeth for possible wear patern which may make your teeth sensitive. If you miss your back teeth and they are not replaced by implants or partial dentures, you will use only the front teeth to chew, thus the teeth will wear down and will become too sensitive due to being exposed to too many chewing forces. Dr Dinca can discuss with you different replacement options for your missing teeth. Avoid or eat less often acidic foods like tomatoes, lemons and oranges, since they irritate the already sensitive teeth. Control the intake of tea and coffee, because they can increase your teeth sensitivity. If you cannot cut back on your daily amounts of coffee and tea, you can try diluting some of your coffee and tea drinks with water or milk to reduce their acidity. Look for tooth pastes and mouth washes with fluoride content, since fluoridation will strengthen the teeth enamel and decrease the sensitivity. Stanous fluoride has a good effect in treating teeth sensitivity. Dr Dinca will advice you in regards to the type of tooth paste you can use for an optimal dental health. If cold water annoys your teeth, simply use warm water when you brush your teeth. Baby teeth are very important for your child's health. Besides the fact they have an important role in facilitating speech and nutrition, they also maintain the space for the adult teeth to grow in the proper position. Poor oral hygiene may cause pain, infection and low self esteem for your child. Establishing healthy dental habits from an early age such as brushing after breakfast and before bed, limiting frequency of sugar intake, and only sending your baby to bed with a bottle of water, not juice or milk, can set your child up for a lifetime of good oral health. No, tooth loss is NOT inevitable. Tooth loss is caused by PERIODONTAL DISEASE. PERIODONTAL DISEASE is a serious gum infection that damages the soft tissue and the bone that supports the teeth. Microorganisms, such as bacteria, stick to the surface of the tooth and multiply, provoking gum inflammation. Gums become swollen, red and bleed frequently, especially with brushing and flossing and teeth become loose. Brushing and flossing is the best you can do at home, on a daily basis, but there is hardened plaque, also known as tartar, which if it is not removed regularly can provoke gum tissue inflammation. Tartar can be removed only by professional dental scalers. Your hygienist “scrapes” the plaque off your teeth along the gum lines and slightly under the gums, allowing the tissue to heal. For most of the adult patients, this build up accumulates every 3 months, so it is important to see your dental care provider regularly in order to maintain your oral health. If you have bleeding gums you think you should leave them alone to heal before you brush and floss. On the contrary, your gums bleed because they are covered in dental plaque and bacteria accumulated along the gum lines, provoking inflammation. Brushing and flossing will help removing plaque from all the teeth surfaces and will help inflammation to come down. You will notice that after a couple of weeks of proper brushing and flossing the bleeding reduces considerably, and will gradually disappear if you continue using a correct brushing and flossing technique. A good oral hygiene combined with regular visits to the dentist will keep your gums free of disease. Some think that unless your teeth hurt you are ok not visiting a dental professional. In fact, most of the cavities don’t cause any pain until they become very large so they affect the nerve of the tooth. As well, periodontal disease is painless until the teeth have lost their bone support at which time the disease is already advanced. Don’t wait till is too late, see your dentist regularly and have the minor problems addressed before they get more complicated. Having the piercing may be cool, but research shows it can cause serious health problems. Tongue and lip piercing can lead to teeth fracture, bone loss and gum recession. Constantly playing with a lip piercing can create gums bleeding and teeth enamel fractures. A more severe problem can be permanent damage of the lip or tongue nerves. Oral piercing is as well a potential risk factor for the transmission of herpes simplex virus, hepatitis B and C, and HIV. Tongue piercing can result in difficulty chewing and swallowing food and speaking clearly. So think twice before having an oral piercing done! Dr. Monica Dinca who practices as a general dentist in Scarborough has some advice for the parents in order to keep their children’s teeth healthy throughout their lifetime. Since most children don’t have the motor skills to brush effectively until they’re 8 years old, parents need to supervise brushing and check to make sure every surface of each tooth is clean. It’s not that they don’t want to do a good job, they’re just not physically capable yet. It’s the easiest way to cause tooth decay, yet parents are still doing it. Whether it’s a bottle at bedtime or a sippy cup all day long, the habit keeps the sugar and bacteria levels in the mouth elevated all the time. If your baby wakes up at night for a bottle or to nurse, wipe out their mouth with a wet gauze or a soft cloth or brush if they have teeth.If you start early on it becomes part of the normal routine. Expert say it’s common to see children 2 or 3 years-old who need to go under general anesthesia to treat cavities and infections. One of the explanations for this is that parents aren’t bringing their babies to the dentist early enough. The first trip should either be when the first tooth erupts or by your baby’s first birthday. Dental visits every six months from the get-go will also help your child feel comfortable—and even excited—to go every time. Bananas, raisins, and whole-grain crackers seem like healthy fare but foods that are sticky and have concentrated sugars like these will sit in the grooves of the teeth and create cavities. Instead of nixing them entirely, eat them with meals— when there’s more saliva— and always brush afterwards. You might think treating a cavity is an easy fix, but cavities can affect your child throughout his lifetime. For starters, healthy baby teeth are necessary to maintain space for adult teeth. They help guide the jaw so it can grow. Plus, if a cavity becomes infected, it can affect the development of the adult teeth and if there’s an abscess, the child will likely need sedation to treat it. Cavities at an early age, especially if they’re not treated, can also lead to problems with speech articulation, poor sleep, and even low self-esteem and school performance. Last year, the American Dental Association revised its recommendations and now suggests children age 2 and under use fluoride toothpaste, too. Although fluoride is controversial, experts agree that the research is clear: it’s one of the best ways to prevent cavities. The appropriate dose, however, is key. For children 3 years old and younger, use the equivalent of a grain of rice, and for children 3 to 6 years old, a pea-sized amount is enough. Nevertheless, if you’re concerned about your child’s exposure to fluoride in the water and toothpaste, come to talk to the dentist at Brimley Dental Centre in Scarborough and we will advise you. A common cause of tooth decay in older kids is sipping on sports drinks and soda at lunch, at games and at home. By bathing their teeth in acid all day, there’s no opportunity for the PH to re-balance. If you can’t persuade your child to completely nix it from his diet, encourage him to limit the amount, then drink it and be done with it. Many would say chocolate is not good for your teeth, but research found that in fact chocolate is effective in fighting cavities, plaque and tooth decay. Cocoa extract is actually more potent than fluoride in preventing cavities. As well, raw chocolate and chocolate with less than 6 g of sugar can be beneficial to your dental health. Compounds in coco bean husk have an antibacterial effect and helps harden the tooth enamel. Moreover,chewing on cocoa nibs can help reducing garlic bad breath. Our office is conveniently located on the south-east corner of Brimley and Sheppard on the ground floor. The office is set up to accommodate handicapped patients as well. We are accessible from the 401, and by public transportation including the Scarborough light rail system close to the Scarborough Town Centre.